Organist Brian Charette takes us on a tour-de-force of the "Once & Future" history of the Hammond B-3 with his fourth album for Posi-Tone! Organ buffs and casual listeners will be delighted to tune in and turn on this groovy and hard-hitting date. The record features an exciting program of musical selections from a wide range of styles, from the funky and familiar to the soulful and original. While the focus and crux of the session rests squarely upon the shoulders of Mr. Charette and his B-3 organ, the strong showings of guitarist Will Bernard and drummer Steve Fidyk also provide melodic highlights and consistently exhibit the kind of strong rhythmic support that always keeps the session in the pocket. 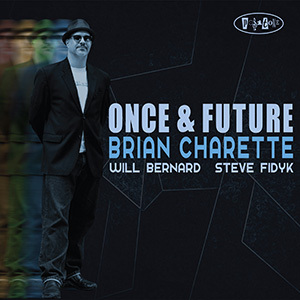 Charette literally wrote the book on the B-3, and his new album "Once & Future" certainly succeeds again and again as a straight forward collection of performances that jazz enthusiasts will enjoy time after time after time.